May is National Bike Month and the perfect time to try pedal-powered transportation. NC State will celebrate National Bike to Work Day on May 18 with a “pit stop” for cyclists near the Memorial Belltower from 7 a.m. – 9 a.m. The university’s event, which will include snacks and giveaways, is one of several in the Raleigh area. Later that day, campus will host a Back On The Bike group ride departing from the parking lot of Carmichael Gymnasium. Participants are welcome to bring their own bike or to ride a campus LimeBike for free. Sign up and be sure to bring a helmet and water. “This is a great way to get back on the bike, especially if it’s been a while since you’ve been on a ride,” said Sarah Williams, an event organizer and the transportation demand manager with NCSU Transportation. 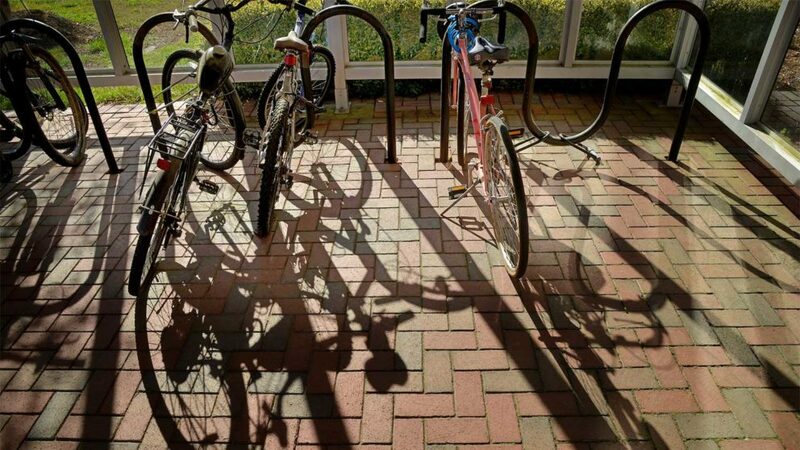 As a Bicycle Friendly University at the Silver level, NC State offers a number of benefits to cyclists, including alternative commuter benefits for students and employees, multipurpose trails, bike racks on all Wolfline buses and bike locker rentals. Bicycle repair classes and campus maintenance stations are also available for students. To get started, register your bike to receive a bike permit and help the university accurately plan for future bicycle facilities while also detering bike theft. Beginning fall 2018, bicycle registration will be mandatory. Published in News, Newswire, Transportation.